A few days after the lamentable death of Ted Perry, Hyperion's founder, this disc arrived in the post for review. And it was with a sad heart that I listened to yet another masterpiece plugged out of obscurity by the genial and mercurial Ted, another jewel in the crown of Hyperion's Romantic Piano Concerto series. The Fuchs concerto is memorable for various reasons. The free flow of melodies and the barnstorming Finale place it securely into the great traditions of the past, a window on a vanished age that comes up as clean as a whistle in the crystal clear recording with Roscoe playing as if his very life depended upon it. Kiels' work is perhaps slightly more subdued but it is beautiful nonetheless with a lengthy first movement that does occasionally wander but that is made up for in the exquisite Finale which is almost terrifying in its unabashed virtuosity. As already noted, there is little to comment upon. 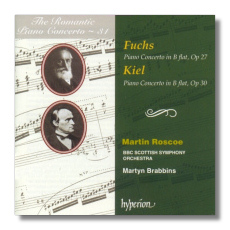 The disc is packed with the usual detailed notes and the playing of the Scottish orchestra is beyond reproach as is Roscoe's marvellous interpretations. Recommended with heartfelt enthusiasm!